Aalayam - Colors, Cuisines and Cultures Inspired! 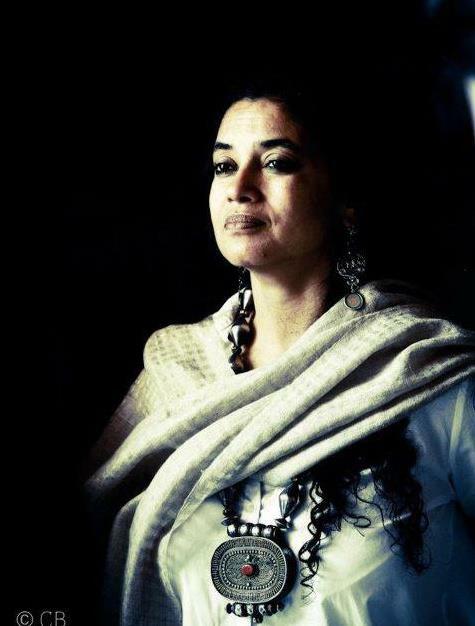 : Karmasuthra - Celebrating the Modern Indian Woman! Karmasuthra - Celebrating the Modern Indian Woman! At Aalayam, we showcase everyday inspirations on design, décor, cuisine, and the cornucopia of cultural eclectics. As you know, Deepa and I are constantly on the look out for brands that can be a great showcase of everything we love about all these wonderful muses. We recently rediscovered a jewelry brand that we wanted to showcase on Aalayam because it had the visual and cerebral appeal of a "thinking woman's" brand. In the bargain, we chanced upon a warm rendezvous with the self-made entrepreneur who is lovingly nurturing the brand like a living force and scored a glorious peek into her home, her heart and her joie de vivre! So, presenting to you "Karmasuthra" and it's catalyst creator - Divya Thomas! Divya Thomas - Picture Courtesy and Copyrights - Karmasuthra Jewelry (c). Riveting, sensual, enigmatic and global in appeal, Karmasuthra Jewelry is a perfect homage to the modern Indian woman. We here at Aalayam, strongly espouse non-conformist style sensibilities, and this two part brand spotlight and artiste feature (yes - including a grand home tour) is not only a befitting ode to this new-age personal style statement, but is a veritable feast for the heart and the mind! Picture Courtesy and Copyrights - Karmasuthra Jewelry (c). I meet Divya Thomas on a gorgeous Saturday morning. She welcomes me into her home for breakfast, coffee and willing perspectives on all my questions. Clad in a crisp white chikan kurta, and almost no jewelry, Divya's kohl lined eyes and ingenuous features add to her enigmatic personality. Divya is waiting for me at the door of her home. And instantly we connect. There is no reserve or reticence..just warmth and welcome. I will wax eloquent about her home, and my sensory revelations during the home tour in the next post, but now, lets talk about her brain child - Karmasuthra. The burning question in my mind was the reason behind the name Karmasuthra. I had to get that question out of the way, so I asked Divya. Why the name Karmasuthra? Was it a bold and evocative play on words? Or did it actually speak to the essence of the brand? To which, Divya had a straight and simple response. 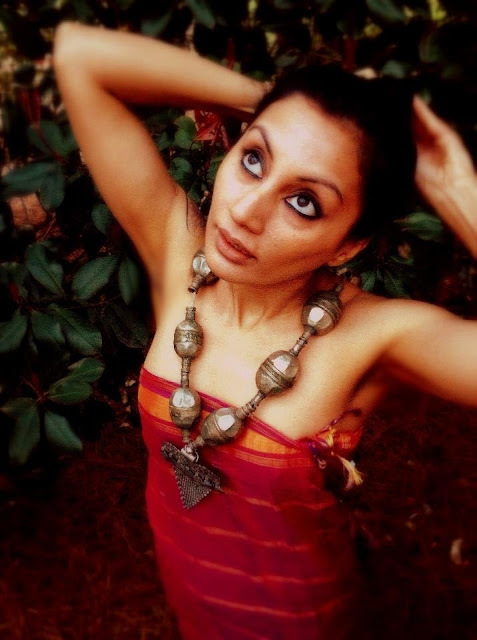 "The name "Karmasuthra" has a sensual appeal.. it sounds just right for the brand." Here's how: "Karma" is the Sanskrit word for "Fate". And an allusion to "What goes around comes around". What started as a germ of an idea to launch a jewelry brand with the name "Karma", evolved into "Karmasuthra" with the inclusion of the suffix "Suthra". "Suthra" is the bind that holds things together. "Karma + Suthra, it just sounded right". I agree. 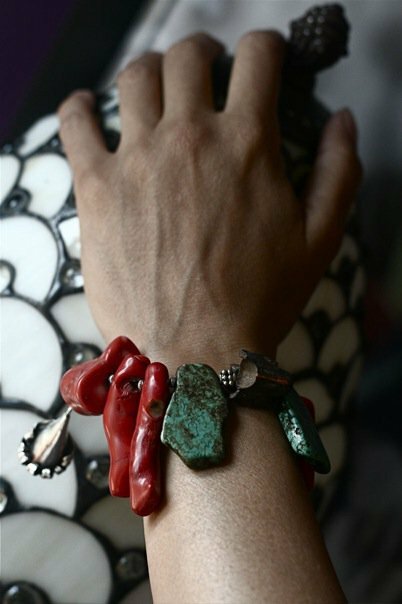 Propitiously named, the jewelry line is indeed a confluence of the colors, textures, artifacts and curiosities, all held together with the providence of hand-crafted patterns. Loads of inspiration + Loads of Coffee, spark the conception of these one-of-a-kind pieces, born as a labor of love in Divya's workshop (workshop picture sneak peek, at the bottom of this article). This utterly joyful "reach into the soul and create" process shows! It shows in the fluid detail and nuances of Karmasuthra designs. "Whether it is the front of a necklace or the back, I want the piece to look beautiful, like it has a life of its own, a personality to remember it by" Divya elucidates. The designs come from the creative recesses of her mind, her heart and fills her and her customers with a whole new level of confidence..to embrace their sensuality and rule the world! 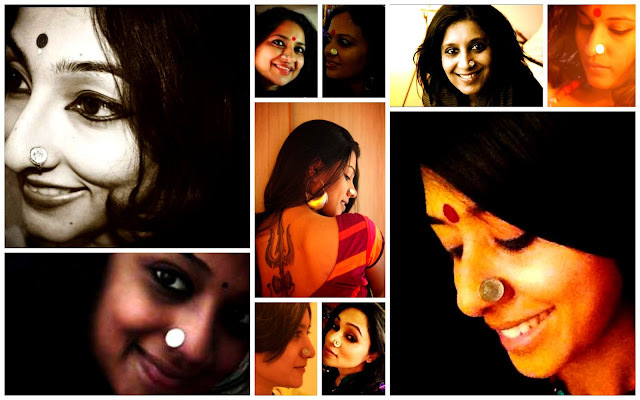 The much in demand nose-pin, and the aquiline, evocative beauties, whose lives Karmasuthra has touched! The whole process of designing the line is therapeutic for Divya. I can relate. Creating a thing of beauty can be an everyday joy. To see her customers aglow with a Karmasuthra necklace or a "jhumka" or an anklet, invigorates Divya to spread the positive energy she always derives from, and associates with, her work. Karmasuthra jewelry is primarily handcrafted by Divya. The material is sourced from all over the world. Bold and vibrant Turkish accessories, beads from traditional African markets or Native American rosaries that come "blessed" with spiritual energy are refashioned with love and finesse in the creative zen workshop. Divya can most often be found immersed in her work, accompanied by soulful music (click here to listen to what Divya's currently listening to) and a glass of wine to rev up the creative process. I asked Divya about how she communicates with her demographic (buyers and aspiring buyers), how she translates their needs into a Karmasuthra style statement. Divya has got the mix of "push" and "pull" marketing right. She says "I style individual, statement pieces for my customers, but most of the time, its the jhumka or the necklace or the anklet that is calling out..to be loved, cherished and owned". "Have no second thoughts, no second guesses. If you fall, dust yourself and move on. At least you tried." Divya's workshop/hidey hole/creative space. Where the magic happens! A true celebration of the Modern Indian Woman. A warm THANK YOU to Divya for letting us into her home, and sharing her refreshing and energizing perspectives with the Aalayam family! 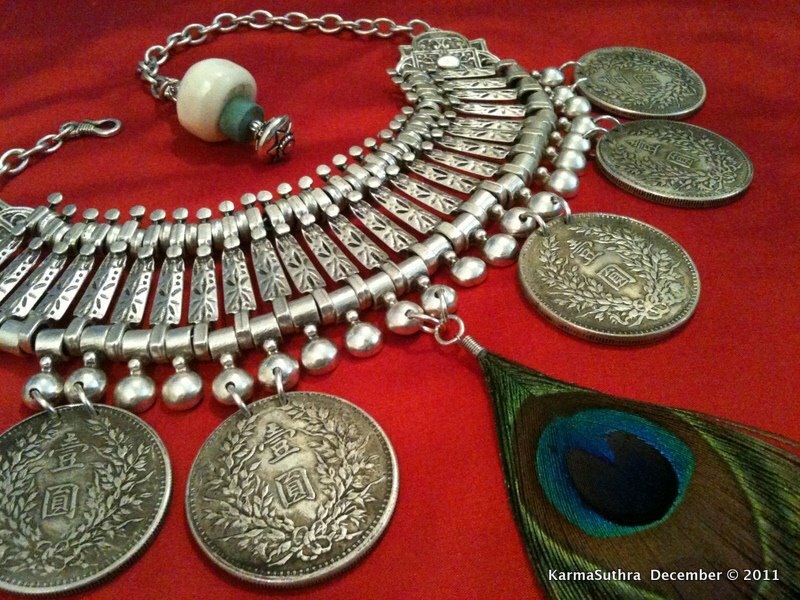 On popular demand, Karmasuthra jewelry can be ordered via the Facebook Page of the brand. Once worn,these exquisite pieces of jewelry are bound to make heads turn. They definitely make a statement.I so WANT to own the anklet. I agree. I am floored by the earthy designs and the personality of these statement pieces!! 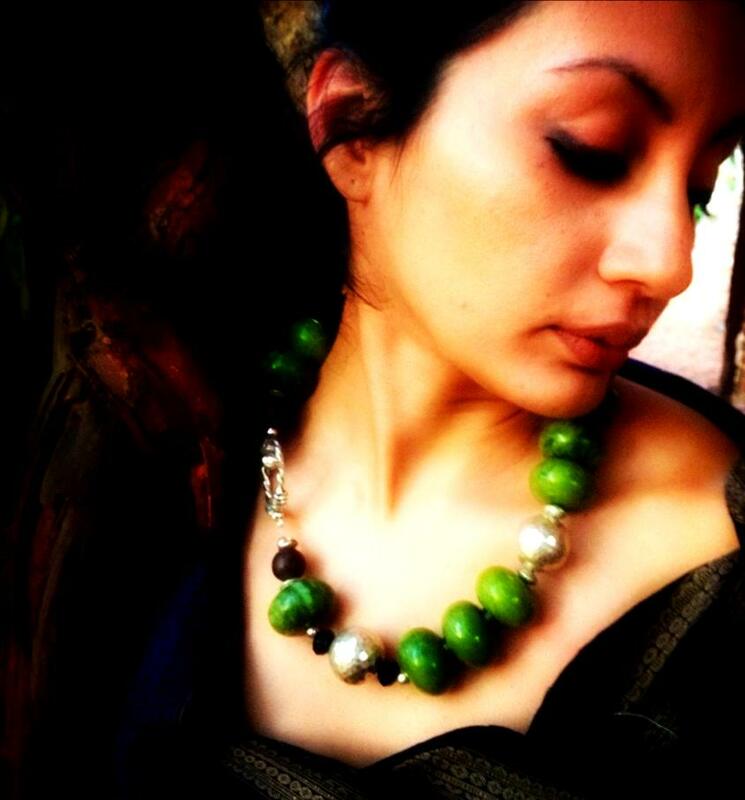 You could order these pieces via the Facebook page of Karmasuthra Jewelry (https://www.facebook.com/pages/Karmasuthra-Jewelry/98728408863). sensational jewelry and amazing blog! cant wait to read the next part! Thank you Mallika!! I am touched by your feedback and comments! and the jewellery amazing! !how can I lay my hands on them? I am so pleased that you like this post!! You could order these pieces via the Facebook page of Karmasuthra Jewelry (https://www.facebook.com/pages/Karmasuthra-Jewelry/98728408863). Thank you for visiting Aalayam!! You keep us going! Great blog ! I loved the way you have described Divya's work. Now you have made it easy for me to explain why I love Karmasutrha . Thanks for that...!!! Thank you dear reader. I sincerely hope you will come back and join the Aalayam family! Thank you for your feedback. I am duly humbled! Your blow posts are so informative and the pictures so beautiful. I am a big big fan of your blog. Continue the good work. Thank you Vani. Your comment and encouragement means a lot to us! Please do come back, Join the Aalayam Family! eToro is the best forex broker for new and professional traders. I wanted to tell something to girls and women who are want good quality artificial jewellery. Many of are afraid of when we purchase jewelry,coz we don't understand that is real,good or not. For them online jewellery. The Sanskrit word Aalayam signifies “a place of residence”, a confluence of ideas and inspiration. At Aalayam, we house our creative revelations in the vibrant world of multicultural design, art and culinary diversity. Here, we celebrate the visual and cerebral appeal of world culture. We hope our salvo through this blog enriches your lives as much as it does ours. 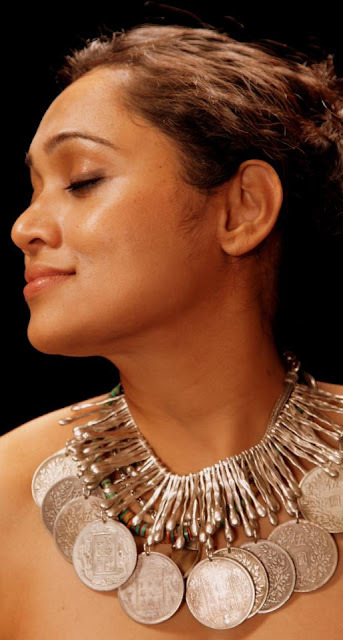 Aalayam is the brainchild of Deepa and Supriya. We are passionate about living the good life and by extension we love design, décor, travel, photography, good food, and the vast richness of world culture! The entries in Aalayam will reflect our ethnic Indian culture while juxtaposing the global appeal for readers, followers and pinners from all over the world. Via feature posts on decor, art and cultural traits, artist spotlights and spicy culinary adventures, Aalayam will strive to be an intellectually, visually and gastronomically stimulating experience for our readers. Come, stay, and get inspired at Aalayam! WRITE TO US AT: aalayaminspiration@gmail.com ! Deepa likes to live the inspired life! Mom, décor junkie, foodie and a clean–freak! She loves glamorous spaces, rich interiors and enjoys cooking simple no-fuss meals. Deepa is a physician by profession. Her mantra- it’s all in the details! 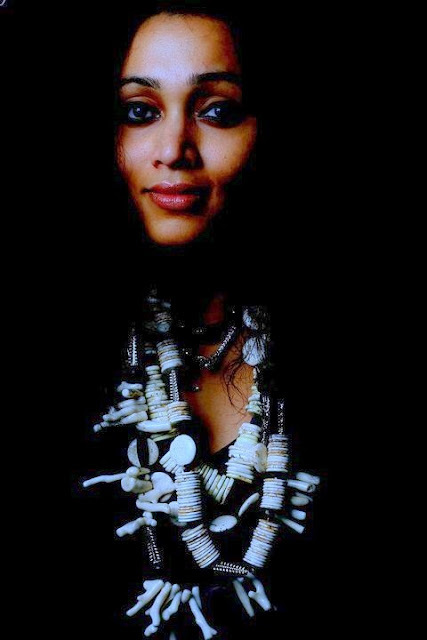 Supriya is an artistic thinker. Parent, Friend, Activist! She enjoys spending Saturday afternoons browsing through antique stores and street fairs to find eclectic items that add a touch of whimsy to her life! Supriya is a management consultant by profession. Her motto - "LIVE LIFE QUEEN SIZE! Drop us a line at aalayaminspiration@gmail.com to discuss your colors, cuisines & creative inspiration!! Dvara -a fusion Indian coffee table magazine and an Antique Indian Home tour! Artist feature and a home tour - "Traditional Indian with a dash of Kitsch"
Dasara Bombe Habba - Lots of color and a little bit of kitsch! Swagatham, Suswagatham - A Bengalooru style home in Virginia! Home Tour - A Tropical Sanctuary! Come Home to a Sanctuary! A Brand Refresh - Varnanggall is back, and so is Aalayam! Come. Stay. Get Inspired. This is YOUR AALAYAM! REPUBLISHING ENTIRE CONTENT FROM THIS BLOG IS PROHIBITED. Logo Design by Artistic Soup. Simple theme. Powered by Blogger.